The use of electronic cigarettes -- e-cigarettes, vape pens, Juuls, and similar products -- is on the rise in schools in the Valley despite prevention efforts. MADAWASKA, Maine — The use of electronic cigarettes — e-cigarettes, vape pens, Juuls, and similar products — is on the rise in schools in the Valley despite prevention efforts. The battery operated devices, most of which heat a flavored nicotine liquid into an inhalable vapor, were introduced as a smoking alternative about a decade ago for adults trying to quit smoking. 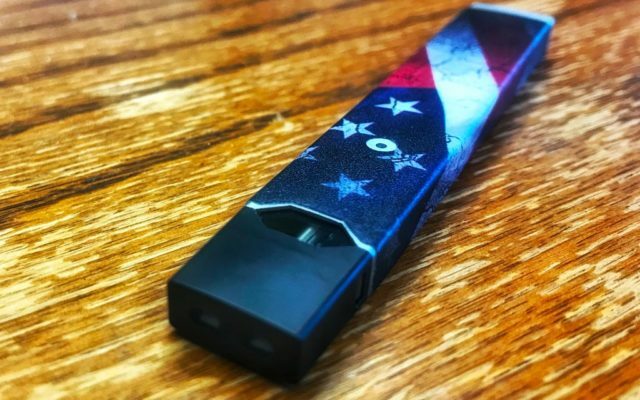 The most popular such product that Valley school officials are seeing students use is the Juul, a small device that looks much like a USB drive, but contains the same amount of nicotine as a pack of cigarettes. While manufacturers say these products are intended to help people stop smoking, the oils used are often flavored, attracting a lot of underage users and giving the “wrong image,” according to Madawaska Police Lt. Jamie Pelletier, who also works as the school resource officer for the Madawaska School Department. Flavors like cotton candy, bubblegum, creme brulee, and “classic tobacco” entice younger students to use the products, many of which contain nicotine. Even if they don’t have any nicotine, vaping liquids can contain other hazardous substances — including some labeled by the U.S. Food and Drug Administration as safe to eat, though not safe to inhale. “Where it becomes challenging is that [students] argue that it’s water vapor not smoke, and it tastes like candy, so how can it be bad for you,” said Madawaska Middle High School Principal Wayne Anderson. “I think, if the kids really knew what they were inhaling, and they really believed that it was detrimental to their health, then I really think we would see a reduction in trafficking and possession,” the Madawaska school principal said. According to data from the Centers for Disease Control and Prevention about 21 percent of high school students nationwide reported using e-cigarettes in 2018, representing a huge increase from about 12 percent the previous year. In Maine, 15 percent of high school students reported using e-cigarettes in a 2017 survey. Since last year, the law in Maine prohibits anyone under the age of 21 possessing, using, selling or distributing any nicotine or tobacco product, including e-cigarettes. Part of the reason for the change was to make it more difficult for high school students and potential smokers to obtain tobacco or e-cigarettes from their 18-20-year-old friends who could buy them. Anyone who turned 18 by July 1, 2018, however, is grandfathered under the new law and still able to by tobacco products and e-cigarettes. Despite the effort and warnings to quit using the products, dozens of students have been disciplined by Madawaska school officials for either possession, consumption, or trafficking. Pelletier said the punishment for violations thus far has been left up to the school to handle internally. “People talk about nicotine addiction but personally I find it funny because the most addictive substance in the world is sugar and sugar will kill you faster than vaping will,” the teen said. Misconceptions about the flavored liquids in e-cigarettes being safe or nicotine free, however, are causing more and more students to use these products, said Anderson. “The younger the child is when they become addicted to nicotine the harder the habit is for them to kick when they are older,” the school principal said. “The kids who vape are not from any specific demographic,” Anderson said. The teen e-cigarette user said he knows the issue is getting out of hand because, despite the law and school policies, minors still are finding ways to buy the various types of e-cigarettes or finding someone to buy the products for them. “In a way, vaping company’s don’t really care about minors buying their products because they are making money and that’s all they care about,” the teen said. Juul, however, did implement a new age-verification system in January to deter minors from buying their products online. The new system requires prospective buyers to share a photo, driver’s license and phone number that the company can cross reference with publicly available data to help verify age and identity. There are, however, other websites out there that do not have such hindrances in place.